I took this pic from an upstairs window the other day. 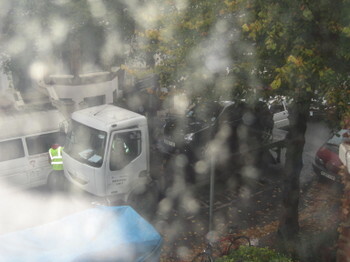 Through the grime and foliage you can make out a car being hoisted on to a clampers' truck. Its driver's sin was parking in a disabled spot. Fair enough. Trouble is, though, the disabled person for whom the space was created moved away months ago, meaning that even the people now living in his old house daren't park outside it for fear of getting a ticket or towed away. Is there anyone in Hackney who doesn't know of a similiar situation? Is there any effective management of disabled parking spaces at all? The article below appeared on the Guardian comment blog yesterday. It sets out the pros and cons of greater regulatory powers over betting shops against the backdrop of disquiet about the bookie-boom in Hackney. The comment thread contains some of the most depressingly gormless responses to any article I've ever written. I'm sure Clapton Pond readers can do better. "There's been a betting shop boom down my way. They seem to be popping up everywhere and some local people are dismayed. Two recent cases highlight this well. A Brentwood-based company has bought a former DIY shop in a street where two bookies trade already: an Observer journalist is among those residents opposed. More conspicuously, Coral has moved into Hackney's Old Town Hall building. Previously it had housed a bank where Tesco founder Jack Cohen opened his first account. I can't say what the late supermarket trailblazer would have made of this new use or the bookie boom generally, but Hackney council is deeply displeased. It is also almost powerless to halt it. Should that change and, if so, why? For me, it's a tricky question. The libertarian in me wants to leave the bookies be. I gamble rarely and frugally and my interest in betting shops is confined to the William Hill chain's amazing time bubble window displays. But "each to their own" is good maxim. It may be true that in largely down-at-heel areas like mine betting shops can become focal points for antisocial behaviour, yet if the bookies weren't there wouldn't the ASB just go elsewhere? Some might argue that bookiephobia is a class-related disorder brought on less by concern than snobbery, and that one person's neighbourhood blight is another's exercise of consumer choice. As for fears over betting shops' increased numbers leading to more problem gambling, well, a recent Gambling Commission report found that the numbers of addicts - like the numbers of gamblers - has remained steady over the past 10 years. Turn the telescope round, though, and the picture looks gloomier. That's when my inner regulator gets twitchy. Problem gamblers aren't spread evenly across society. 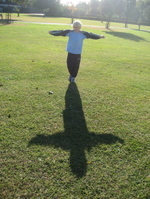 The greatest concentration is among the young, especially males, and the poorest. Gamblers from these groups are those most likely to go to betting shops, and betting shops now provide the most costly - for the punter - forms of gambling: video roulette, a new kind of slot machine. The Gambling Commission report said that one in nine users of these touch screen terminals had a gambling dependency of some kind. The government did not prohibit such machines in the Gambling Act (2005), which came into force two months ago. Should it have, as the Tories say? Then there's the flip side - the individual freedom argument. Problem gamblers aren't only a problem to themselves: their families feel the knock-on effects and the poorest will, as ever, be those with the fewest ways of escape. Shouldn't the law be doing more to protect them? Shouldn't local authorities have more power to do the same and in so doing better serve the whole of any community adversely affected by a betting shop's presence? There is merit in the view that shutting places down doesn't, of itself, solve problems linked with it. Yet when premises of whatever kind effectively institutionalise activities on public streets that intimidate or damage those who live in or also use them, the case for closure can't be dismissed as mere nimby rage. Those are the two sides of my dilemma: a small one but possibly instructive too. I'm leaning towards favouring greater controls. Prohibiting people's potentially risky pleasures can easily be an excuse for self-serving moralism and, in extreme forms, cause huge harm (look at drug prohibition: a catastrophe). Yet laissez faire approaches can be fig leaves for indifference and neglect, and if any new power over gambling outlets were devolved to local authorities it would a small victory for democracy. I would, though, like to know what readers think." I should have qualified that last sentence as follows: "I would, though, like to know what readers who've actually read the article and have brains in their heads think." Over to you. So we were wandering across the Downs the other late afternoon and suddenly he thinks, "I know, I'll throw a shadow that looks like that Angel of the North thing I've seen pictures of." And so he did. He does ladies lavatory signs too. "In Hackney, we are surrounded by a climate of disadvantage, and it's up to schools to be the movers and shakers in bringing about change. We cannot afford to wait for things to change - we must make it happen. And that means working with and fighting against the borough's poverty, bad housing, poor diet and lack of access to books and new technologies. Of course, everyone must try harder. But schools, in particular, need to do more, simply because they are an integral part of society sitting in the heart of their communities." I'm not in the grip of some mad obsession with this tree or anything (woof woof). But I took this on Saturday. Amazing how its colour had changed in just three days. In this entry (posted on Thursday) I wrote that I was waiting to hear from Cllr Nicholson, our regeneration man, about any new powers given to the Council under the Gambling Act (2005) to control the spread of betting shops. He'd told the Gazette that he'd be looking. On Friday a Council spokesperson provided the following statement. Powers for local councils to control the proliferation of betting shops remain limited. Under planning law, betting shops come under the same planning category as banks (A1 usage: financial and professional services). Therefore the conversion of the HSBC on Mare St into a betting shop didn’t need to come to the Council for planning permission. Even when there is change of use, it is hard for Councils to legally justify turning down betting shops under current planning law, which favours the free market approach. This, we already knew. We now also know the following. Councils have just (under the Gambling Act) been given powers to grant licences for betting shops. This power previously sat with magistrates who very rarely turned down applications, and the Pridmore licence on Chatsworth Rd was one of the last to be granted under the old system. The Council remains concerned that the grounds on which betting shop licences can legally be refused are difficult to prove. The Gambling Act also specifically prevents Councils turning down licences on the grounds that there are already too many betting shops (the demand test). There have been no applications for betting shop licences to the Council under the new system and, until there are, it will be difficult to gauge how the new laws will work. The Mayor has written to ministers about this and the Council is speaking to other local authorities about working together on this issue. So it's a case of fingers crossed and wait and see as far as the Council is concerned. But what the statement doesn't explain is what those "grounds on which betting shop licences can legally be refused," are. Suppose I'll just have to plough through the legislation. If anyone else finds time to do this before I do, let me know. Tomorrow, in place of the advertised event, Chats will host an African storytelling performance by Odiri Ighamre featuring music, animals and lots of audience participation. Suitable for ages 3-7. Starts at 2.00 pm, all tickets £3. The head of Stoke Newington School has just landed the top job at our future fourth academy, the City of London KPMG on the site of the poor old Homerton Technology College. I will restrain myself from commenting at this stage. Anyone else? 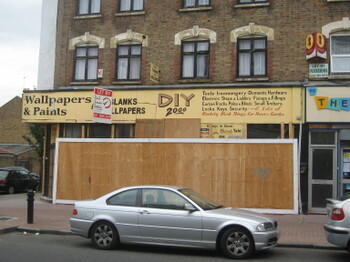 I took this photo of the former Blanks DIY shop - oh, the pots I've emulsion I bought there! - in Chatsworth Road almost a month ago. I noticed the other day that nothing's changed. You'll recall that the Brentwood-based bookmaking company Pridmore have bought the property with a view to opening a betting shop there. 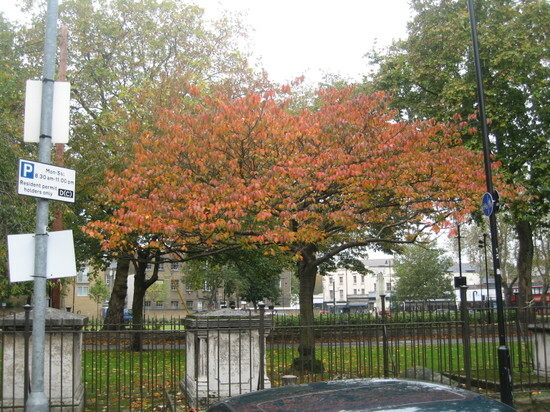 There has been opposition from some residents and from the Council, which is unhappy about the bookie-boom in Hackney generally - a subject I address here. Why the lack of action? I contacted Pridmore who've just replied to say that the refurbishment is "a little behind schedule" but that the shop should be in business "in time for Christmas." They claim they have "a great deal of local support" and are looking forward to opening. Meanwhile, I await word from Cllr Nicholson, cabinet member for regeneration and 2012. In April he wrote a letter to the Gazette in which he said that he'd be looking at new powers granted to local authorities under the Gambling Act (2005) - which came into force on 1st September - to see if they give any grounds for councils to prevent premises being used for gambling. Has he found any? Watch this space.